As the title suggests, we’re going on a journey back into time. For this edition, we’re going on a spacewalk through 15 years of Kozzmozz. So expect to hear a lot of the Kozzmozz classics from the glorious 90’s. 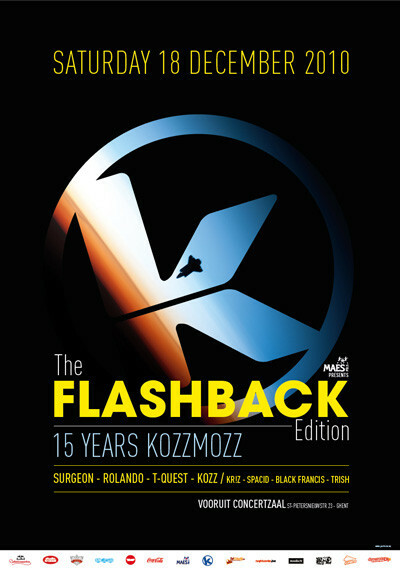 The Kozzmozz spaceship embarked on its maiden voyage into the universe of techno in 1995. During the past 15 years it has explored and conquered many shades and evolutions within the genre showcasing a wide range of big international guests and Belgian wonders in several great venues. To celebrate the 15th birthday of all these marvelous musical travels, we’ve made a fine selection of artists that are bound to take us back to many great moments that we’ve experienced on the Kozzmozz dancefloor. We are very happy to welcome back our original residents Kozz and T-Quest who will join us once more for this very special occasion. They were an intrinsic part of Kozzmozz from day one and even though they have both ventured into other projects these last few years, they still know the Kozzmozz sounds and crowd like no other. If anybody can show us what Kozzmozz was all about, they can! They will be joined by Surgeon, who embarked on his first Kozzmozz journey in 1998 in the ICC. He has been back several times since, also teaming up with Ben Sims as Frequency 7 and British Murder Boys with Regis. This time he will handle the decks on his own again. Having burst onto the scene around the same time as Kozzmozz has, with 4 albums on leading Berlin techno label Tresor, he also knows what true, underground techno is all about. The second international guest is Rolando who performed for the first time on Kozzmozz at the world famous club The End in London where we touched down at the turn of the new millennium. Rolando was also part of one of the huge editions at Kuipke and our tent at Tomorrowland. Having been part of the legendary Underground Resistance crew and responsible for one of the biggest techno tracks ever made, the ‘Knights of the Jaguar’, he is without a doubt another leading force of the techno nation. As we’re taking a trip into the past, we obviously don’t forget the dj’s who played an important role both in the early and later years of Kozzmozz: Spacid, who played on the third edition and was a regular guest at the ICC where he also hosted the chill-out and electro rooms. Trish Van Eynde, the leading lady of Belgian techno and ex-Fuse resident, and Black Francis, one of the first generation techno dj’s, who played on the first three editions on the Jozef K boat. And of course, there is also our current resident Kr!z, who started with us in the young talent room and has been resident in the main room for several years now. This special edition means a special party and that means special effects, special decorations and a mighty laser. We’ll change the Vooruit into a spacecraft travelling through time and space. For the brave ones, those who come dressed in an astronaut costume will get in for free.